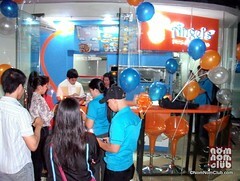 In a bold move to cater to the mall-going crowd, Angel’s Pizza opened its newest branch at ETON Cyberpod in Ortigas. This is the call-center-dominated mall across Robinsons Galleria crossing Ortigas Avenue. Simply a pedestrian crossing away from Robinsons, the new Angel’s Pizza ETON Cyberpod still focuses on delivery to nearby customers in offices and condominiums. This is evident through the 6 customer-seat capacity of the pizza store mainly due to the big kitchen space necessary for a pizza chain where the dough and pizza are created. The opening ceremony started with a blessing of the store. Passers-by were also treated to some free pizza slices through out the day in conjunction with the 30% Off whole-day first-day promo. NomNom got to try some of the pizza flavors and even take home a box of pizza courtesy of Angel’s. You may consider this new branch as a transfer from their former branch in the Pasig area (near Julia Vargas corner Meralco Avenue) which has now closed. UP/G ETON Cyberpod, Corinthian, EDSA corner Ortigas Avenue. 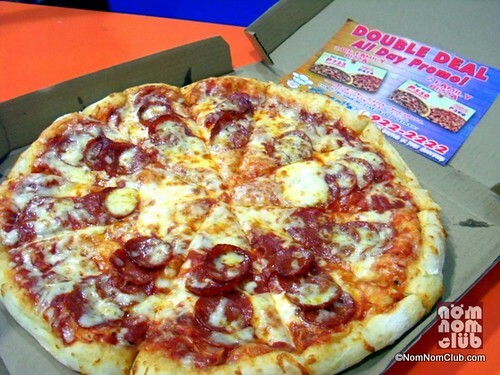 Their “Double Deal” all-day promo is still ongoing where you can get 2 pizzas for the price of 1 on selected flavors. Kudos to Angle’s Pizza ETON Cyberpod for this bold move of having a mall-based branch.